We didn’t know we needed a festival curated by the Deftones, but now there is one we’re intriqued. 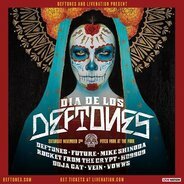 Yes, Dia De Los Deftones is a one day event to be held this year at San Diego’s Petco Park on at November 3. Deftones will naturally be playing, as will Mike Shinoda, Rocket From the Crypt, HO99O9 and more.